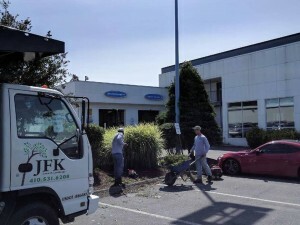 Consult JFK for all your commercial ground maintenance needs! There is a lot of work that goes into running a successful commercial business. One component that can sometimes be overlooked is ground maintenance. Many companies make the mistake of neglecting to care for their property after they have finished landscaping it. 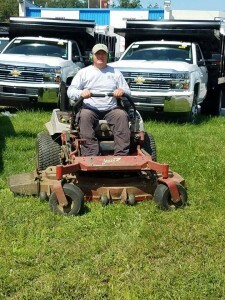 We at JFK Lawn and Landscape are happy to help your commercial business with all its ground maintenance needs! Customers are everything to a business. Without a steady flow of customers, a retail or commercial business is not likely to stay afloat for very long. For this reason, it is important to maintain a good public perception. It does not matter if it is a regular office building, a car dealership, hotel, a church, doctor’s office, or a retail shop. If the grounds outside of your facility are unkempt, it will give off a poor impression to anyone who enters the building. Your aim should be to make the exterior of your building and property attractive as possible to draw people inside. Why not try and maximize the value of your property? Homeowners do it all the time, and so should your commercial business. It is amazing what a few plants and trees can do for your landscape. If someday you decide you want to sell your property for whatever reason, you should receive a higher return if has been maintained over the years. Employee and customer safety should always be a primary concern for any business. By not maintaining your landscape, you are running the risk of some suffering an injury. For example, common tripping hazards include fallen sticks or slipping leaves in your parking lot or walk ways. In the winter, properly managing the snow and icy conditions are a higher priority for safety on your property! It doesn’t matter which season it is, JFK will help keep your premises clean and clear of any potential safety concerns. Companies are in business to make money. It is that simple as that. An easy way for a commercial business to maximize profits is to find ways to lower their heating and cooling costs. This can be accomplished through utilizing shrubs and trees around the facility. By strategically planting greenery, a business can increase the amount of shade it receives every day. Consult the experts at JFK, and we will suggest an array of landscaping ideas to maximize shade for your commercial business. This entry was posted on Tuesday, August 15th, 2017 at 5:04 pm. Both comments and pings are currently closed.